Then Kanye’s monologue began. Kanye sang the lines, “I want to cry right now, black man in America,” then spoke in disconnected fragments about black Democrats, liberal media and his future presidency. Kanye’s strange and impromptu speech went on multiple tangents; in it, he claimed the cast bullied him for wearing his “Make America Great Again” hat on stage, then defended Trump and blamed the liberal media for dividing the country. As he spoke, the cast members on stage shifted uncomfortably but did not leave the stage. In his speech, Kanye implored audience members to have a dialogue, not a diatribe and said, “Follow your heart and stop following your mind . . . If you want the world to move forward, try love.” After his rambling speech, Kanye started performing “Ghost Town” again and the featured artists joined in as cast members rushed off the stage. Some think the speech not airing on NBC was censorship. However, the broadcast was over when West addressed the live audience. He spoke without anyone at the show interrupting him and recorded snippets of his words which are available online. Chris Rock recorded Kanye’s speech and posted it to his Instagram story. Mike Dean, Kanye’s music producer, posted the end of Kanye’s speech to Twitter and it has 1.75 million views. If people want to hear him, they can look up his speech online and draw their own conclusions from it. In any case, the musical guest is invited to perform songs, not give speeches. 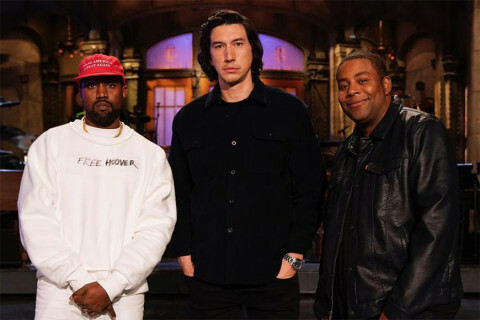 Over the following week, SNL members responded to Kanye’s actions. On Late Night with Seth Meyers, Kenan Thompson, who never went on stage, said Kanye’s claims of bullying are unfounded as cast members “cater to the hosts.” On October 6, SNL’s Pete Davidson addressed Kanye’s speech on Weekend Update. Davidson said Kanye wore his MAGA hat all week and asked Kanye to take his meds rather than proclaim that the “real him” is in control. At the end of the segment, Davidson revealed his “Make Kanye 2006 Again” hat. Davidson has been open about his bipolar disorder, which Kanye was diagnosed within the past. On October 11, as Hurricane Michael attacked the southeast, Kanye met with Trump in the Oval Office to discuss pressing issues, such as crime in Chicago, racism and mental health. He mentioned that he was misdiagnosed with bipolar disorder – actually sleep deprivation – and how he stopped taking medication. In response to a press question about his 2005 outburst during Hurricane Katrina he answered that black people have a “welfare mentality” and he had one in 2005. His focus on black people being industrious highlights his view that by gaining wealth independently, black people escape racism. Kanye said his MAGA hat makes him feel like Superman, as though he could do anything. Before the discussion ended Trump called him a “smart cookie.” Kanye and Trump punctuated the unproductive talk with a hug. As someone who is not a fan of Kanye and is only familiar with his music through his singles, and his political views from Twitter, I am incredulous at his outburst. His siding with a president who has proven in the past that he “does not care about black people,” and who continues to disregard other people of color in this country, is perplexing given his focus on love and dialogue. The Republican administration has not shown love to the people targeted by deportation policies, by police brutality or by sexual assault, among other issues. Over the last two years, Kanye’s rampant support for Trump has given him publicity and made him a relevant topic of conversation. As a black man, he defies expectations, partnering with Trump to make changes to prisons and the education system. Kanye is in denial about the real implications of racism in America and how it created the systems he is criticizing. I keep trying to make sense of Kanye, but the majority of his speeches do not make sense. His credibility wavers every time he revises history by saying that slavery was a choice and that we – black people – are under mind-control. As an American citizen, Kanye West has the right to voice his support for whomever he chooses. As a celebrity with major influence over the public, he is acting irresponsibly by speaking for all black people without any caution. As a man, he needs some help.